A new perspective on the calamitous fall of France in 1940 and why blame has been misplaced ever since In this revisionist account of France's crushing defeat in 1940, a world authority on French history argues that the nation's downfall has long been misunderstood. 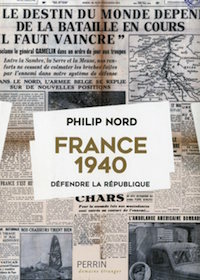 Philip Nord assesses France's diplomatic and military preparations for war with Germany, its conduct of the war once the fighting began, and the political consequences of defeat on the battlefield. He also tracks attitudes among French leaders once defeat seemed a likelihood, identifying who among them took advantage of the nation's misfortunes to sabotage democratic institutions and plot an authoritarian way forward. Nord finds that the longstanding view that France's collapse was due to military unpreparedeness and a decadent national character is unsupported by fact. Instead, he reveals that the Third Republic was no worse prepared and its military failings no less dramatic than those of the United States and other Allies in the early years of the war. What was unique in France was the betrayal by military and political elites who abandoned the Republic and supported the reprehensible Vichy takeover. Why then have historians and politicians ever since interpreted the defeat as a judgment on the nation as a whole? Why has the focus been on the failings of the Third Republic and not on elite betrayal? The author examines these questions in a fascinating conclusion.